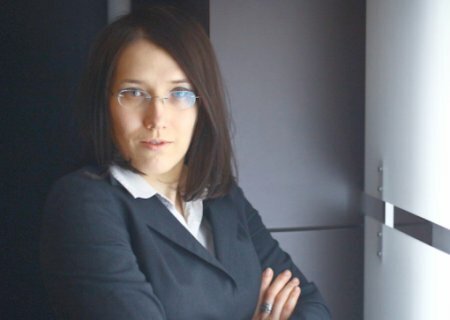 Eugenia Gusilov is the director and founder of ROEC. A Fulbright alumna and a graduate of Columbia University, New York (USA), she has a Master of International Affairs with a concentration in International Energy Management and Policy and a Certificate from the Harriman Institute with a thesis analyzing the Russian Production Sharing Agreements. She also works as a Business Development Manager at Umbrella Group. Her work experience includes political analysis, energy consulting, academic and business research, and business strategy. Her areas of expertise cover: strategic and commercial analysis of energy markets, oil and gas policies, and energy economics. Ms. Gusilov leads and represents the center, forges partnerships and maintains relationships with all relevant stakeholders. Responsible for plannning, coordination and effective implementation of ROEC projects and events, she oversees and enforces QC for all ROEC analytical work. She charts the course for organization development and chooses the strategies used to achieve that vision. As a fellow energy analyst, she carries out research and analysis work, and contributes to all ongoing projects. The second most profound effect of Crimea’s annexation (after violation of sovereignty and territorial integrity) was a brutal blow to Ukrainian ambitions for energy independence. In 2013, things looked promising for Ukraine: it joined the Energy Community, it updated its Energy Strategy up to 2030, it committed to implement the EU energy acquis (3rd Energy Package), it was looking forward to develop shale gas deposits in the Eastern and Western part of the country and deep offshore fields in the Black Sea (neither of which have been explored before). Shale gas and Crimean offshore gas resources were a particularly lethal combination, as they could have given Ukraine a real opportunity not only to wane off Russian gas, but to start exporting its own gas to Europe. Events on the ground rendered these potential resources “damaged goods” – de facto impossible to access. Whether intended by Russia or not, the result was upstream access-denial in two prospective areas: deep Black Sea waters and Donetk. The first condition for economic security is to have national security. Crimea’s annexation and the following events in Eastern Ukraine robbed Ukraine of both. With Crimea occupied by 45,000 Russian soldiers, and another 9,000 in Eastern Ukraine, with 400 km of Russian-Ukrainian not under control of Ukrainian authorities, with more than 9,000 people dead (combatants and civilians), over 20,000 wounded and 1.5 million of IDPs since the outbreak of hostilities in March 2014, it is difficult to talk about economics. However, economics is an important part of the effort currently underway to turn the country around and avoid the fate of a failed state. Today, Ukraine is engaged in a historic battle against corruption: it set up a new Anti-Corruption Bureau and established a special prosecutor fighting corruption. Years of domestic cronyism, corruption, and kleptocracy have slowly eroded the country from within. Nowhere has corruption been more extraordinary than in the energy sector. To reform a system that delayed reform for 25 years is hard enough in peaceful times. To do that while Russia is occupying Crimea and waging an undeclared war in Eastern Ukraine is beyond hard. For Ukraine (a country out of rope and out of time), it is the only option, self-preservation, do or die. The task is formidable. 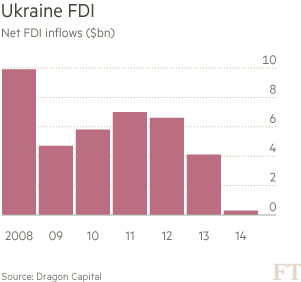 FDI in Ukraine fell dramatically in 2014 (see graph below). Investors have pulled out citing geopolitical risk and force majeure. From 15% to 28% on wells deeper > 5 km. The rate for SOE gas was set at 70% (to provide subsidies for vulnerable consumers). These taxes were supposed to be temporary and apply only in 2014, but remained in force during 2015. In mid-2015 (July), a draft law on royalties was introduced in the parliament that proposed their reduction to 29% (for deposits up to 5 km) and to 14% for natural gas extracted from deeper deposits. This rate was set to decrease further to 20% and 10% from January 1, 2018. The draft did not change the rate for SOE gas producers (70%). However, this royalty bill was rejected on October 6, 2015, and another one (co-authored by Yulia Tymoshenko) was approved which decreased the rates for both independent and SOE producers: to 29% for gas fields up to 5 km; and to 14% for gas fields deeper than 5 km. Domestic gas consumption has dropped significantly in the past 10 years: from 76 Bcm (in 2005) to 42 Bcm (in 2014), a drastic contraction of demand. Gas transit through Ukraine (once the main transit corridor of Russian gas supplies to Europe, 80%) suffered a similar fate. The construction of Nord Stream I (55 Bcm capacity) has reduced by half the volume of gas transited through Ukraine: from 121 Bcm (in 2005) to 59 Bcm (in 2014). Of the total natural gas consumed by Ukraine in 2014 (42.6 Bcm), imports represented 19.5 Bcm: 14.4 Bcm came from Russia and the remaining 5 Bcm from Slovakia, Poland, and Hungary. Year 2015 brought further decreases in gas import volumes from Russia. By November 2015, Ukrainian gas imports stood at 16.2 Bcm, of which only 6.2 Bcm were form Russia while the remaining 10 Bcm – from reverse flows. Russia and Gazprom view these reverse flows as illegal, an attempt to create ‘false competition’ since Russian gas is competing against Russian gas. But, the EU’s vision for the common energy market is that once a gas molecule reaches the EU it can be traded freely across the continent. Already in October 2014, Ukraine received its first gas from Norway. Europe’s focus on enforcing EU energy legislation and achieving progress on the common energy market may open yet new opportunities to Ukraine such as access to gas that will enter Europe via the new Lithuanian or Polish LNG terminals. In the question of reverse flows, Romania is the only EU-Member State neighbor that, to date, failed to help Ukraine in this issue, citing lack of adequate gas-export infrastructure despite having the best gas position in the CEE region (indigenous resources). However, in 2012 the combined potential of unconventional gas (CBM and shale gas located in the Lublin and Dniepr-Donetk basin) and the unexplored deep-water gas in the Black Sea was estimated to be between 20 and 50 Tcm (not proven). It is worth stressing that the deep offshore of the Ukrainian Black Sea shelf (largely believed to be gas-prone) was never explored with modern technologies. It is in this context, that Ukraine organized a tender in 2012 for two deep-water areas on the Ukrainian Black Sea shelf: Foros and Skiska (Skifskii), near the Ukrainian-Romanian border. The Foros block received no bids. The Skifskii block was awarded in August 2012 to a consortium formed by Exxon, Shell, OMV Petrom, and Nadra Ukrayny (PSA). Needless to say that Chernomorneftegaz is on the US and EU list of sanctioned entities. On the other hand, Chornomornaftogaz (the subsidiary of Ukrainian state owned company Naftogaz in charge of offshore activity) was re-registered in Kyiv. Chornomornaftogaz has licenses for 17 fields, of which 11 gas fields, 4 gas condensate and 2 oil fields. 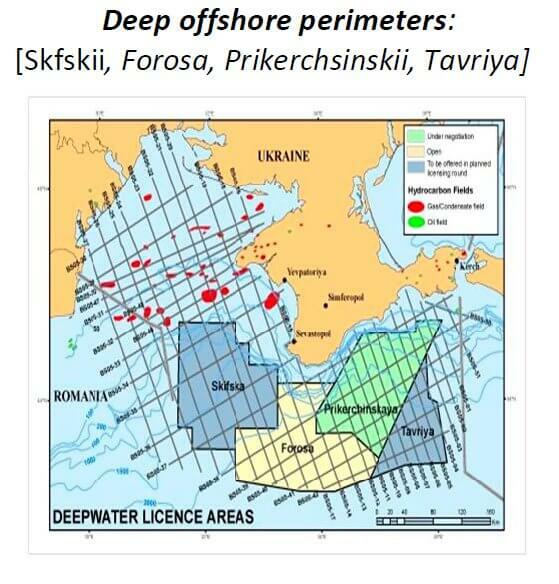 As the O&G map above shows, Ukrainian hydrocarbon production is located in shallow waters. To make things worse, in July 2015 Russia adopted a new Sea Doctrine, of which a few aspects merit attention for the purpose of this discussion. As one would predict, section “Activity for monetization of marine energy and mineral resources” lists as long-term aims, among others, the “study of geological structure and definition of the resource potential of the continental shelf of Russian Federation”, “government control and regulation of exploration and production”, and the “development of identified offshore fields and intensive exploration of prospective oil and gas resources on the continental shelf of the Russian Federation” (p. 13-14). Later in the document, in section “Military marine activity” one can read: “The Federal Security Service (FSB) of Russian Federation [RF] organizes and ensures in the framework of its responsibilities the defense and protection of RF’s state borders, inland waters, territorial sea, exclusive economic zones, continental shelf and their natural resources.” (Art. 46, p. 19). Art 48 on the same page goes on to specify “In those cases necessary, the Military Maritime Fleet and the structures of FSB work together to solve tasks”. Since Russia considers Crimea part of Russia, it is only a matter of time before it will act to assert its sovereign right in what it considers to be its rightful “continental shelf”. In fact, this has already started to happen. Yesterday, December 16, 2015, the Ukrainian State Border Guard Service reported that Russia has deployed the Tavrida floating drilling platform in Ukraine’s marine economic zone. Moreover, the Ukrainian agency reports that: “Earlier, Russia’s Federal Security Service sent its vessel to “protect” the Russian-seized drilling rigs near the Crimean coasts from Ukrainian ships.” The Russians view the matter of Crimea closed, not up for debate. Ukraine and the rest of the world sees it otherwise. The two perspectives could not be further apart. Meanwhile, Kiev’s attention is overstretched with immediate, more pressing issues, such the war in the East, renegotiation of current gas contract with Gazprom and “winter package”, fighting corruption across the board by creating the institutional framework and legal basis to act, by launching much needed and delayed reforms, etc. However, in the issue of Crimea it will need the full support of the international community: “Concerning Donețk and Lugansk regions, I do not think it will be long before Ukrainian authority will be reinstalled there. But Ukraine alone will not be able to solve the Crimea problem” said Ukraine’s Ambassador to Bucharest in an interview this fall. 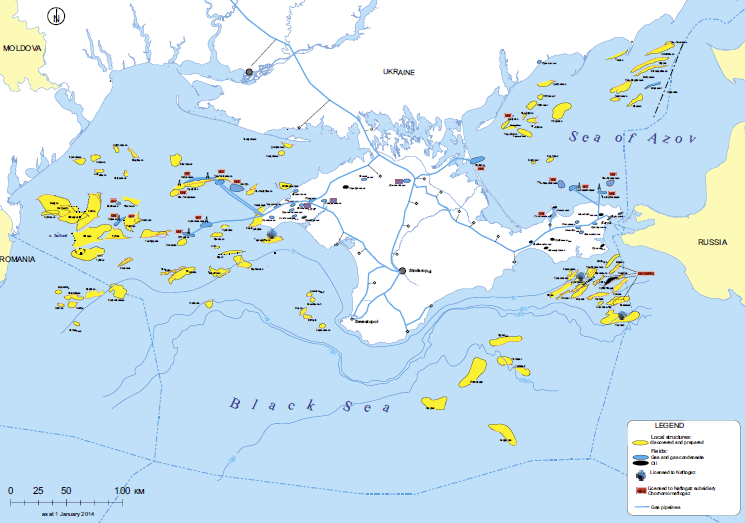 Military and geopolitical considerations aside, if there ever was an ulterior energy-related motive for Russia’s 2014 aggression, it could not have been for the 2 Bcm Crimean production, but for the untapped deep water potential of the Ukrainian Black Sea shelf that gave the country renewed hope for energy independence and even gas-export. Crimea’s annexation and subsequent military build-up creates a reality so hostile and disruptive that no investor can go there. 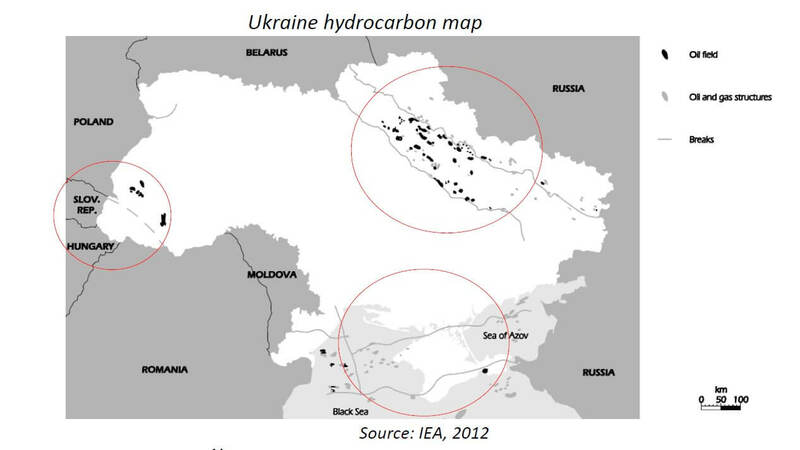 Deliberate strategy, perfect storm, or unintended consequence, the main outcome of the March 2014 annexation was upstream access-denial to Ukraine’s most promising untapped hydrocarbon areas. Crimea’s increasing militarization (including statements of the intention to deploy nuclear arms to the peninsula) is meant as the ultimate deterrent and shows that nothing is off the table for Russia when it comes to geopolitics and defending its monopolist market share in Eastern Europe. For a detailed account, please see Anders Aslund, “Ukraine: What Went Wrong and How to Fix It?”, Chapter X “Cleaning up the energy sector”, pg. 185-206, PIEE, Washington D.C., April 2015. EIA/ARI World Shale Gas and Shale Oil Resource Assessment, Jun e2013, Part X- Eastern Europe (Bulgaria, Romania, Ukraine), p. x-3 and x-4. Energy Community, 2015 Security of Supply Statement of Ukraine – Report for 2015, Following the Results of Monitoring Security of Natural Gas Supplies, Kyiv, September 2015, p. 9, 13. IEA, Ukraine 2012, p. 84. Four jack-up rigs (Syvash, Tavrida, Petro Hodovanets, and Nezalezhnist) and 8 fixed drilling platforms. Ukrainian refer to it as “Hlibovske” UGS.